Ever wanted more control over whether your party will get a pre-emptive strike when a battle begins, or a surprise attack from the enemy? This plugin provides you with a way to guarantee a pre-emptive or surprise by setting some variables. the next 3 battles, you will have pre-emptive strike. During each battle, the variables will automatically be decreased by 1, so you don’t need to worry about updating them yourself. By managing these variables in your events or skills, you can create forced pre-emptive strikes or surprise attacks, which leads to different mechanics and storyline tools for your game. Download the plugin and place it in the “plugins” folder in your project’s “js” folder. 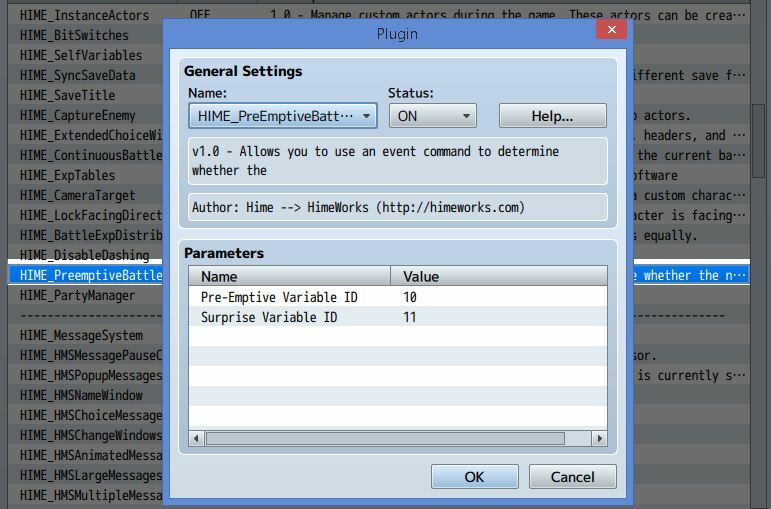 Then open your Plugin Manager (F10), double-click an empty row, and select the HIME_PreEmptiveBattleEvents plugin. In the plugin parameters, choose which variables will represent pre-emptive strike and surprise attack. Then, you can just set them up in your events, or any other methods that you know to change variable values. When the pre-emptive variable is greater than 0, you will be guaranteed the first action in your next battle. Similarly, when the surprise variable is greater than 0, the enemy will get the first action. Only one of these variables should have a non-zero value at anytime. Question Hime about not this plugins but about the Nice Animated Icon you have for when the player need to press the action bouton. Can you show me how to add it in my project? Quick question though. Does this cancel out the default behavior for first-strike? Or will the default behavior occur if both variables are 0?